In a break with tradition, Rosendale Primary School in Lambeth has been encouraging its early years pupils to be more active by embracing technology. Thanks to a €5,000 grant from the It’s Great Out There Coalition, Finnish children’s wear brand, Reima, provided 85 of their innovative ReimaGO activity trackers for the School’s children to wear over the summer half term. According to the World Health Organisation’s recommendations, children should do at least one hour of physical activity a day. Yet the latest Change4Life data shows just 23 per cent of boys and 20 per cent of girls meet this target. Furthermore, one in five children now start primary school overweight or obese, rising to more than a third by the time they leave. 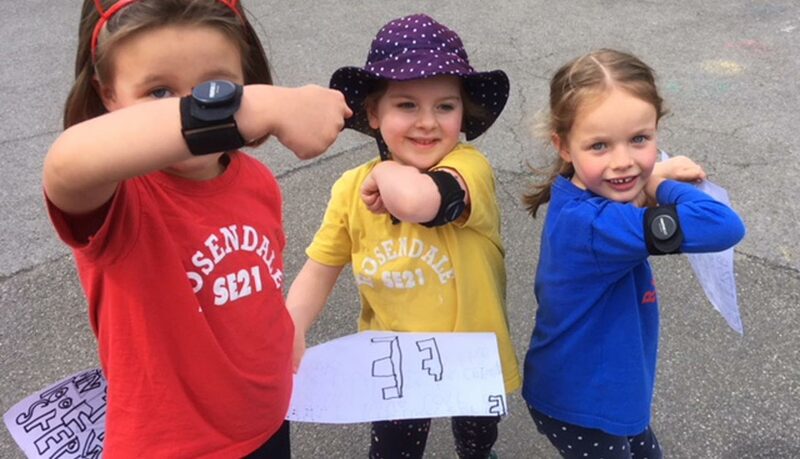 Results from the Rosendale School study reveal that – when wearing the activity tracker for a full school day – the children were active for an average of 2 hours and 50 minutes. Their most active time was between 12 noon and 1pm and the highest daily level they reached was 4 and a quarter hours towards the end of the study. The Rosendale project follows a similar pilot study conducted by ReimaGO at Hafren Junior School in Powys, Wales last year in which 70 children from Years 5 and 6 wore the trackers both at school and at home over a period of six weeks. Children here averaged 22 hours of activity each week, or four hours a day. ReimaGO now hopes to work with more primary schools across the UK. The trackers provided to Rosendale School will remain with the School – a prerequisite of the #itsgreatoutthere grant – for future Year 1 and 2 children to take advantage of. The ReimaGO tracker is a wearable movement sensor able to track the duration and intensity of physical activity. The durable, waterproof sensor is placed in a pocket or on a wrist band. The collated data is turned into ‘energy’ for a virtual character in a mobile app which parents and teachers can download onto their mobile phone or tablet. They can then follow their children’s activity levels, keep an activity log and set goals. A video of the Rosendale School Project has been produced and is available to view and embed here https://youtu.be/J0FnWv1CP24 and a shorter version here https://youtu.be/EMB3q_W7z60. You are welcome to use this video within any content you produce regarding this story. Social media handles include @Reima_Official, @greatoutthere and @SpringPROutdoor. For press enquiries, interview opportunities please telephone Spring PR on 01666 824180 or Rosendale Primary School on 0208 6704962.